This Dwarf Garden Sage plant was planted from one of our little pots in June. It quickly grew to almost two feet in diameter and about 12 inches tall. The next spring it was hitting about 2 feet tall and blooming like crazy. Notice the perfect complement of the cute little edging thyme, Heretus Thyme. 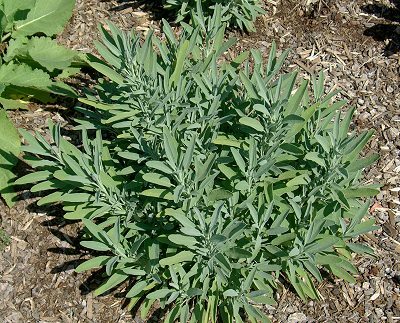 While Dwarf Garden Sage may be a petit version of regular Garden Sage, it has the same robust flavor and can be used in any recipe calling for sage. 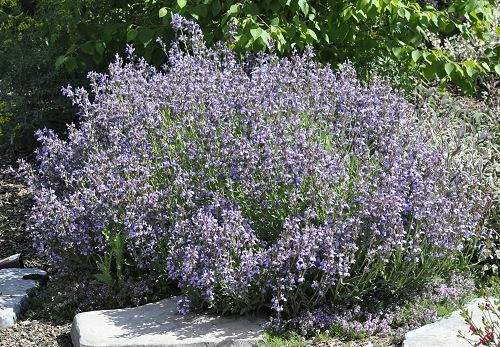 Also, like Garden Sage, Dwarf Garden Sage has pretty purplish-blue flowers in early spring which make great garnishes for salads or quick sauté dishes. Try planting with Chives and Lemon Thyme which bloom around the same time as the sage. Medicinal This plant has been discontinued. You might try Window Box Garden Sage.